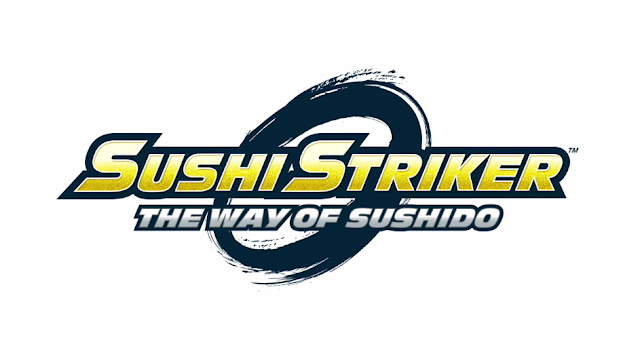 By LUDWIG VON KOOPA - New game: Sushi Striker: The Way of Sushido. Never heard of Sushi Striker? Neither have we. It's a world premiere! 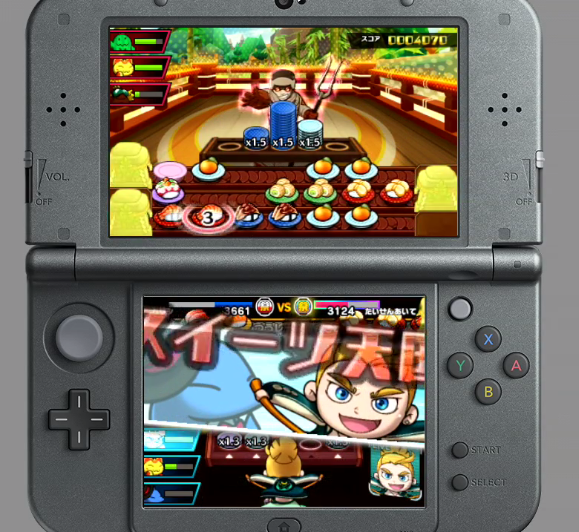 Sushi Striker: The Way of Sushido is a Nintendo 3DS game from indiezero, featuring sushi plates and sushi and animals and... yeah, matching sushi plate colours. Just read our log and figure it out, since we're still having trouble with the concept and we don't have enough time to dwell on it right now, given our very busy E3 Weeks 2017 Schedule. (6:12:21 PM) (breezinabout@msn.com) I thought they were eating! (6:12:23 PM) (rawkhawk2010) I thought those plates were 3DSes. (6:12:37 PM) Ludwig Von Koopa: Eat sushi and stack the plates! (6:12:41 PM) Ludwig Von Koopa: Throw the plates at your opponent! (6:12:45 PM) Ludwig Von Koopa: Plate-smacking action puzzle! (6:13:30 PM) (breezinabout@msn.com) The style of this reminds me of Elite Beat Agents. (6:13:37 PM) Ludwig Von Koopa: Reminds me of Rhythm Heaven. (6:13:48 PM) Ludwig Von Koopa: Probably 'cause of those posing dudes. What, you WEREN'T expecting this? (6:14:22 PM) (rawkhawk2010) I know I'm already interested in it. Here's some gameplay. ...I don't know what's going on here. (6:14:47 PM) (rawkhawk2010) The NES Remix people did this. (6:15:24 PM) Ludwig Von Koopa: Musashi is a girl? (6:15:50 PM) Ludwig Von Koopa: Guess it's a guy. (6:16:10 PM) (breezinabout@msn.com) I thought they said it could be either. (6:16:12 PM) Ludwig Von Koopa: "The game is obviously all in Japanese... and in development right now"
(6:16:38 PM) Ludwig Von Koopa: Both you and your opponent have three conveyour belt of sushi. 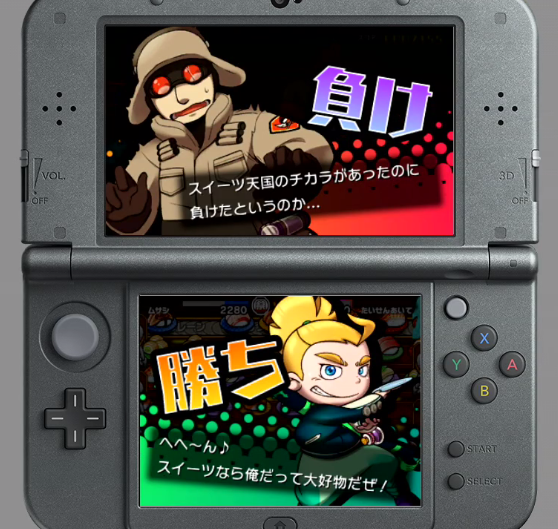 (6:17:22 PM) Ludwig Von Koopa: so it's Puzzle & Dragons? (6:17:29 PM) (rawkhawk2010) I think I like the music. (6:17:37 PM) (rawkhawk2010) From what I can hear. (6:18:33 PM) Ludwig Von Koopa: Easier to combo plates of similar colours. (6:18:55 PM) Ludwig Von Koopa: So you eat the sushi and throw. (6:19:09 PM) Ludwig Von Koopa: REALLY? (6:19:14 PM) (rawkhawk2010) Has Vortex? (6:19:16 PM) Ludwig Von Koopa: You're missing out! The top is what Ludwig is thinking with regards to his un-sushi-eating staff members. (6:19:28 PM) (rawkhawk2010) I've even shrimp. (6:19:33 PM) (rawkhawk2010) And fishsticks. (6:19:37 PM) (rawkhawk2010) But never sushi. (6:19:52 PM) (rawkhawk2010) 1-Up Girl is in the background again. (6:20:04 PM) Ludwig Von Koopa: This guy has a blue pony. (6:20:06 PM) Ludwig Von Koopa: Unicorn. (6:20:14 PM) Ludwig Von Koopa: Musashi has a lion supporter. (6:20:22 PM) Ludwig Von Koopa: ...oh I thought they said lanturn. (6:20:25 PM) Ludwig Von Koopa: But it's lion. (6:20:27 PM) (breezinabout@msn.com) Never had sushi, unless you could the underdone shrimp I had on holiday one time that made me sick right through the night. (6:20:28 PM) Ludwig Von Koopa: ...I think. (6:20:32 PM) Ludwig Von Koopa: Yikes. (6:20:53 PM) (breezinabout@msn.com) It was not pleasant. (6:21:12 PM) Ludwig Von Koopa: ...okay I guess it is lanturn. (6:21:33 PM) (rawkhawk2010) Isn't LantUrn the Pokemon? (6:21:41 PM) Ludwig Von Koopa: ........oh. (6:21:54 PM) Ludwig Von Koopa: There's levels and experience points and S-ranks and stars and scores. (6:22:01 PM) Ludwig Von Koopa: Get more animal companions. (6:22:15 PM) Ludwig Von Koopa: Top hat penguin. (6:22:22 PM) (rawkhawk2010) So there are Sushimon? (6:22:32 PM) (rawkhawk2010) and yeah the music in this is good. (6:23:06 PM) (rawkhawk2010) The cat is basically a Skitty. (6:23:20 PM) Ludwig Von Koopa: Each companion prefers certain kinds of sushi and their metres will rise at different rates. 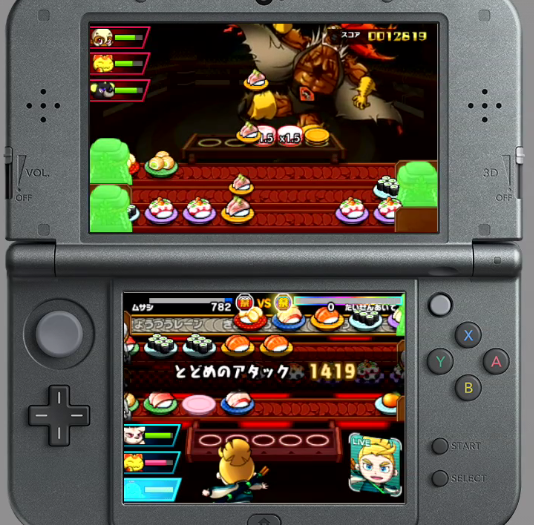 (6:24:01 PM) Ludwig Von Koopa: Penguin transforms sushi into dessert, replenishing health. (6:25:06 PM) Ludwig Von Koopa: Playing game makes you hungry. (6:25:09 PM) (rawkhawk2010) Teresa's about to SWITCH IT UP! (6:25:21 PM) Ludwig Von Koopa: There's a Cactus companion. (6:25:41 PM) Ludwig Von Koopa: There's an EXP Share. (6:26:00 PM) Ludwig Von Koopa: Boss battle. (6:26:39 PM) (rawkhawk2010) This reminds me of that Toei anime that got canceled. (6:27:01 PM) (rawkhawk2010) The one they were trying to make become the new Dragon Ball so everyone would forget about it. This guy has some serious chest... issues. (6:27:08 PM) Ludwig Von Koopa: There's a two-player mode. (6:27:39 PM) Ludwig Von Koopa: 2018. (6:27:50 PM) Ludwig Von Koopa: But for this year, there's the 2017 ARMS Invitational up next. (6:27:52 PM) Ludwig Von Koopa: ...yippee. Stay tuned for the next reaction log and the final one for Wednesday: The ARMS Invitational Tournament! The previous Nintendo Treehouse Live log is here. 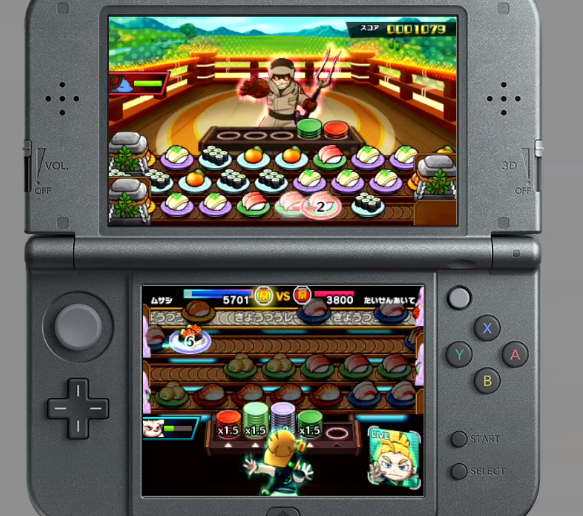 A year later, and Sushi Striker: The Way of Sushido is released on both 3DS and Switch. One version is clearly superior.